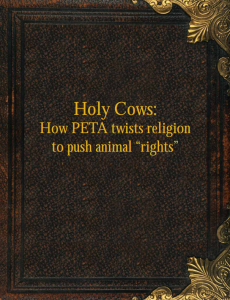 Years ago, we published a report, Holy Cows, on the willingness of People for the Ethical Treatment of Animals (PETA) to manipulate religious teachings to peddle its radical animal liberation agenda. Nothing has changed. Just this week, Sarah Withrow King—the director of PETA’s self-serving religious affiliate, Jesus People for Animals—penned an opinion piece that managed to somehow find a way to use the Pope as a vegan archetype. In other words, dieting like the Pope means dairy and meat—not bovine liberation and lima beans. This isn’t the first time PETA has distorted, and then exploited, the words of Pope Francis. Less than a month ago, PETA and its animal liberationist comrades jumped all over media reports of Pope Francis hinting that animals might go to heaven. Animal lovers were delighted by the news, which validated hopes that their furry family members would join them in the afterlife. But vegan radicals like PETA and HSUS were thrilled for a different reason. Both groups seized the news stories—which, incidentally, proved completely false—as opportunities to insert animal rights ideology into theology. PETA’s eagerness to capitalize on the cultural reverence invoked by the Pope is despicable, and just the tip of the iceberg. Unfortunately, PETA seems to only worship at the altars of hypocrisy and greed.